Holley is writing over at HolleyGerth.com about things that inspire her. She offered the question, ” Who inspires you?”, and invited a sharing of hearts. As I pondered this prompt last week, immediately my eyes were drawn to the beauties sitting near me… My Sweet Girls. My daughters both have an essence of confidnce I have never truly been able to capture. They are aware of who they are and what they want, so easily. They just KNOW. It blows me away all the time. She sets her own style, with flair; laughs at all her own jokes, with relish; dances to 80’s songs, thanks to my Mom; and has not one single inhibition of sharing her love for others. She is fearless and she is full of a Joy that comes straight from a knowledge she is precious and loved. She has known since she was 3 that she was meant to be an artist. Everything she does is punctuated with color, patterns, and brightness. She illustrated her first book when she was 11. Everyday she draws me something special to tell me she loves me. She inspires me to rejoice! She inspires me to believe boldly! She inspires me to pray fervently! She inspires me to love! She reminds me of God’s sweet Joy over me. This verse in Zephaniah encourages me to think of the future God has in mind for me and it inspires me to reach out and grab a hold of Him with reckless abandon. This is exactly how she lives, in joy and abandon of the world’s shackles. Live in joyous abandon of the world’s shackles. Our oldest has a quiet strength that radiates in the core of her being. 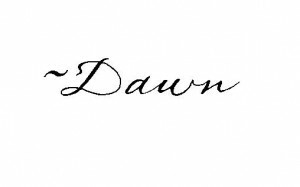 Her life experiences, so challenged in her health and her journey, have created an aged wisdom in her approach to life. She is the polar opposite of our youngest and prefers the quiet of a book, the solitary view under a tree, and the freedom to just sit and be still. At the age of 2 she told me Jesus was God. She had a deep faith long before I really knew what faith could be. She has lived through trials few have ever had to experience, and persevered. She knows who she is, too. Just like her sister. She knows God loves her and has made her for a purpose, His Glory. She can walk in a room and assess each situation exactly for what it is with glaring precision. She has a gift of discernment that belies her age. Her laugh is extremely contagious. I find myself trying to make it bubble out of her as often as possible. She is faithful and loyal to those who have shown themselves to be true. She has a passion for history and study that encourages the best teacher to challenge her with more subjects to learn about. When things don’t come easy, she never makes an excuse but trudges through the trail, blazing her own path with her head held high. She has a quiet confidence that keeps her grounded and sure of her convictions. She inspires me to push through the trial! She inspires me to trust more. She inspires me to hope expectantly. She inspires my faith to soar! She reminds me that trusting in God’s faithfulness is the only way to live. Because she knows that she is loved by One who is faithful, she can be still in all circumstances. Since she is aware that she is on His radar, she has a continual audience with the LORD. His faithfulness creates a stillness in the storm which allows our petitions to be heard with clarity. All of my children inspire me to be better. They provide many opportunities for me to exercise faith and grace in my day. They are the real test of transparent living, because they are usually there in all my failures throughout the day. Some days, I fail fully… in blazing fashion … and I have to ask forgiveness. Thankfully, they are more than willing to give me grace each time, also. You ARE capable of confident greatness leading lives full of joyous abandon and dancing. Today I want to remind you that you, too, are capable of big things…great things. You are loved immensely. God in his greatness reminds us repeatedly of his heart towards us. We can be confident, like a young woman who does not doubt that she is loved. We can be strong like a young woman who has endured trials and emerged resilient and refined. 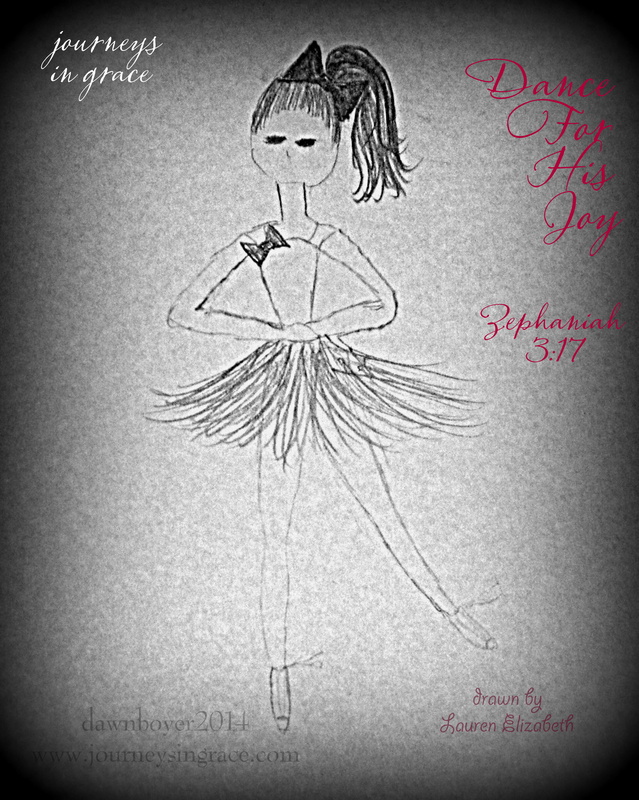 We can Dance for Joy as He rejoices over us! My sweet girl made the artwork for this post. She is learning about Degas in art, which means there is an abundance of ballerinas floating around the house. These 4 pictures are my favorite. I love the way she captures the beauty of all that I love about my girls. They have the freedom to dance their own story through life and to rejoice in their limitless beauty. 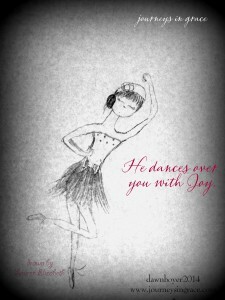 I want to challenge you today to step out in faith and dance in His joy. Be inspired in your own beauty to move beyond the limits of your comfort zone and be confident in the gorgeous princess God created you to be. What is the song you hear when God calls your name? Will you dance under his rejoicing joy? ** Disclaimer! My kiddos are real, and completely imperfect. They need Jesus just like I do. Every day I am reminded of the adversity and strength that is embedded within the fabric of their character. They love deeply. They sing loudly. They dance with Joy. But more importantly, they know that they are LOVED, and out of that abundance, they touch others for eternity. Visit Holley for a little more encouragement. NextWhat if…. You believed God’s Heart is for You? Are we treating others as we ought? What a beautiful tribute to your daughters. I love how you described each one in such detail. I have five children and each one inspires me in a different way. 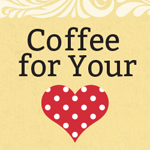 Thanks for sharing this post today and thanks for linking up with Holley. Thank you for sharing with me, Jacqui. I barely touched the surface with all that I see in my girls, I had to limit myself. 🙂 You are right, each one inspires me differently. This was so beautiful and such and encouragement to me this morning! Thank you! 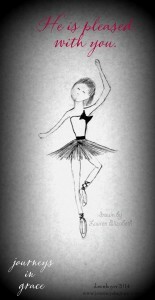 !and I love the ballerina pictures!! I am so thankful you were encouraged. 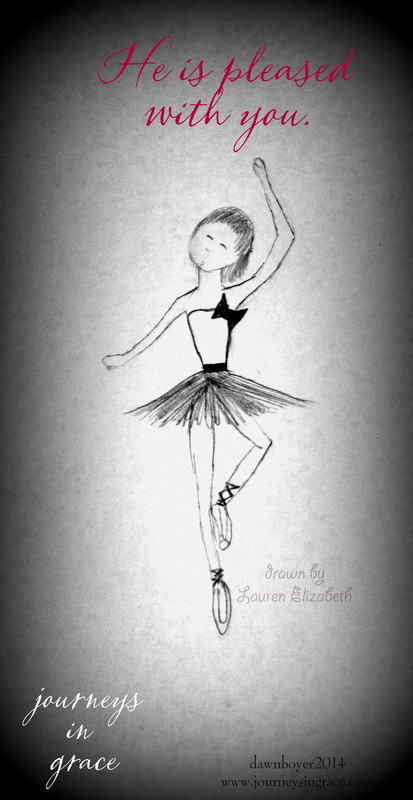 The ballerina’s are quite precious to me, but the artist even more. 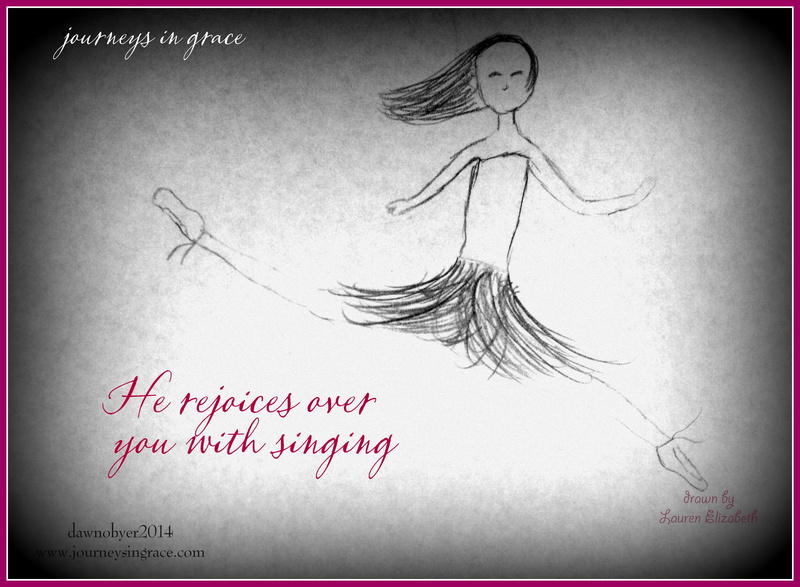 Joy is one of her gifts, and you can see it even the drawings she creates. I absolutely love the artwork in your post! I want to “Pin” it 🙂 Degas is one of my favorite artists, and I have a deep love for ballet as well! Thank you for sharing your talented daughter’s creative gift! Blessings to you.